Hi, long time, no see! I have been unable to do any art or blog over the last month, LIFE! Anyway, I am back in harness now, well sort of. Because of the break I am finding it difficult to get into the swing of things. When I couldn’t do art I was painting pictures in my head, do you do that? However, now that I can I have a block! Plenty of ideas, all those pictures in my head, but when I sit down at my table, nada! I just look blankly at my paper or canvas. We have all been there I suspect. Well things have been kick started by the urgent need to do a mini journal for my lifelong friend Shelly who is starting a new chapter in her life. She and her husband have sold up their house and are in the process of buying a fifth wheel caravan (whatever that is) and they are going to amble the byways and highways of NZ. Shelly turned up this week all full of excitement she was going to give in her notice that night, and in two weeks FREEDOM! Shelly and I were students at Polytechnic together all those years ago, she did photography and I illustration. I have been more fortunate in being able to follow my bliss, she hasn’t. She has had to work at jobs she has hated for so many years. So you can guess what this will mean to her! I am so happy for her. I will miss her, but hey, there still is Skype internet and so on. 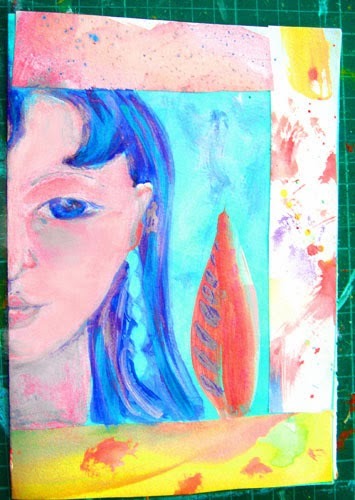 I am doing the journal because we have a lot of history between us and we have always been there for each other with our arty efforts, we even have had what we call “arty farty” show and tells to each other when either of us have thought we were losing the creative edge. Anyways, I started this yesterday, the journal will be A5 size and I still have a little work to do on the face and I have all the text to add. But it is a start. A funny story for you. Another sort of friend (?) turned up last night and was going on how about I would miss her and wasn’t I jealous etc., you know the sort. She is a woman that it is difficult to get a word in her chatter. Well for the first time I stopped her in her tracks! First of all I will have to explain that in NZ we have several sayings that mean isolated areas. – ‘beyond the black stump’, ‘wop wops’ and ‘like Eketaunga’. Now Eketaunga does exist, it is a one eyed little town that most of NZ thinks epitomizes wild isolation. Well Ekataunga is only 40 or so km up the valley. Yes, I live in a rural province and most of NZ regard it as the Wild West! Back to the story, this woman asked me where Larry and Shelly were heading when they set of on the 17 Oct. I replied “Eketaunga” . She just stopped in mid speech and spluttered, eyes rolled and muttered something about getting home to cook her hubby his dinner. I think she thought I was taking the mickey. But, they are going to Eketaunga, they have friends there and are going to call in on them and stay a few nights. What a hoot, I wonder whether I will see her again? I hope not, this visit showed me she is malicious. It's a beautiful journal page, I am sure your friend will be very moved by it. I love her blue hair! I get blocked sometimes too, I am glad you are forging forward. Sorry about the negative interaction. I hope your friend who is going adventuring has a wonderful time! I am sure you will keep in touch. lovely pages Sharon, and a funny story! I've heard about Ekataunga, or rather I've heard that name before I think. It sounds familiar. And that "dear visitor" , it's hard when you are too polite to tell people what you think, I feel that way sometimes. And sometimes it would be good to just let people know. Would you be so kind and send me your address? I tried to mail something to you a long time ago, but it was returned. LOve your journal pages, Sharon. So glad you are able to find time to do art again. Wellcome back! Isn't it wonderful to paint inside the head. I often do it when it is impossible to paint really. Now You have a good start, it is coming nice journal. What a brave move to sell up and go travelling! Good luck to them:) and what a great source if inspiration! good to see you back Sharon! What a lovely gift for your friend. An exciting adventure for her for sure. Enjoyed your little story-who needs a "friend" like that? 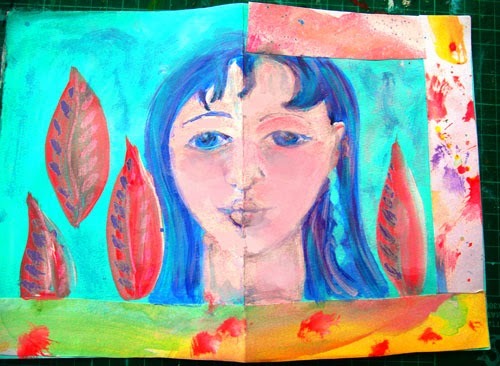 Your journal looks beautiful Sharon and welcome back to art and creativity. So nice to see you back Sharon!! Life is busy or me too...lovely work!!! Welcome back to blogland! I'm sure your friend will cherish your thoughtful and very beautiful journal. Blessings, my friend!